Watermelon and cookouts go hand in hand. 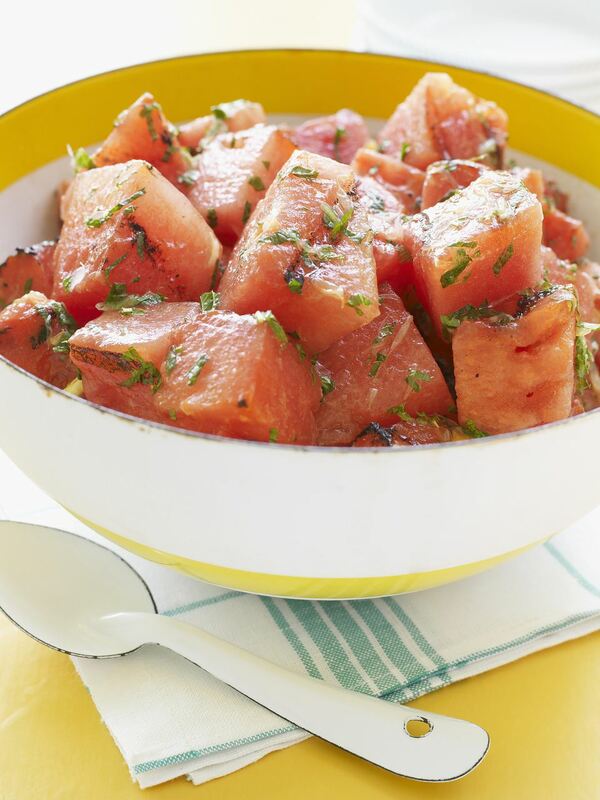 This recipe takes the watermelon to the grill for a good quick sear. Tossed in a simple syrup with chopped mint, gives this summer time staple a nice refreshing makeover. Enjoy as a side dish or as a dessert. If you're looking for a savory option, that information is also included in the instructions. This is a must try at your next cookout! Prepare simple syrup ahead of time. At least 30 minutes before grilling the watermelon. To do this, simply bring 1 cup of water and 1 cup of water to a boil. Make sure to stir often during the process so that no burning occurs. Once sugar is dissolved and mixture has thickened a bit, remove from heat. Allow the simple syrup to cool at room temperature for 20 to 30 minutes before using. Run whole, uncut watermelon under cool water. This will dislodge any debris that may have collected on the surface. Wipe off with a clean kitchen towel or a few paper towels. Place watermelon onto a large cutting board and cut in half lengthwise, then cut those halves in half again. Make certain that you purchase a seedless watermelon as this will not only help with grilling but will make eating the salad less work. Oil grill grates using large grilling tongs and several folded paper towels. Try to make a few passes on the grill grates to ensure that fruit does not stick onto the surface. Place watermelon quarters on grill flesh side down. The object is to get some nice grill marks and a little caramelization. Aim for 2 to 3 minutes per side. Promptly remove and place onto a cutting board. Let watermelon cool for a few minutes before handling. Cut red watermelon flesh away from the outer skin and remove any white parts. Cut red portion into 1 1/2 inch chunks. Drain off any excess liquid that is released. Place watermelon pieces into a large bowl. Add 1/3 of simple syrup and work up from there. The object is to flavor the watermelon, not to drown it in liquid. Add chopped mint and gently toss with a spatula. Either serve immediately or cover and place into refrigerator until ready to serve. It is recommended to make this dish the same day as your cookout. Savory option: If you would prefer a savory alternative to this salad, omit the simple syrup and add chopped mint, thinly sliced red onion and crumbled feta or blue cheese. Serve as a cold salad. Refrigerate for at least 1 hour before serving.